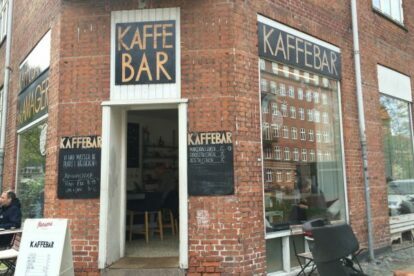 If you are on an exploration trip to the island of Amager – or you live here and are going into the city, make it a must to visit ‘Kaffebaren’ at Æblestien. Just on the verge of the inner city, you have a place where it feels like you dropped by someone’s apartment for a quick mocha. The place is small, so you sit in the windows, in rows behind the counter or you go downstairs to have some room to kick up your feet. Kaffebaren is run by the same lady who makes and serves your coffee. No giant industry behind it, no labels, no money-man in a dark office. Just the good old love of coffee and people. They are wind powered and 60-90% ecological. As they say “we want to do good by you, but also by others”. If you don’t want to stay, that’s fine – bring your coffee along. But don’t miss out. This is crafty coffee with a thought behind it and it’s the cheapest coffee I’ve stumbled upon. Make sure to have a snack while you’re at it. It’s ecological and home-made.